Donuts appeal to the kid in all of us. Whether it is glazed, jelly-filled, or covered in sprinkles, a donut is sure to brighten even the dreariest of mornings. Satisfying a donut craving typically requires a drive during rush hour traffic to the nearest donut shop or spending half the morning trying to make them at home. This ingenious two-ingredient recipe will have you serving up piping-hot donuts in no time. Start heating your vegetable oil in a frying pan over medium heat. While waiting for the oil to get hot, open the tube of biscuit dough. Separate the biscuits, and form each one into a round donut shape. Cut out the middle using an empty pill bottle or whatever you may have around the kitchen that will make the appropriate size hole. 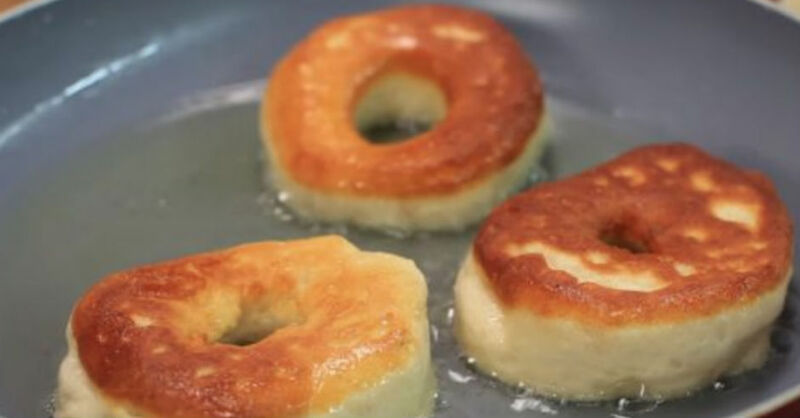 Place the donuts in the hot oil, and fry them until they are golden brown on each side. Once the donuts are cooked to golden perfection, top them with your favorite glaze topping or cinnamon and sugar. Don’t forget to fry up the “holes” you cut out as well. These donuts are sure to leave your friends and family thinking that you are a kitchen hero. It is up to you whether you tell them that they are actually a breeze to make.